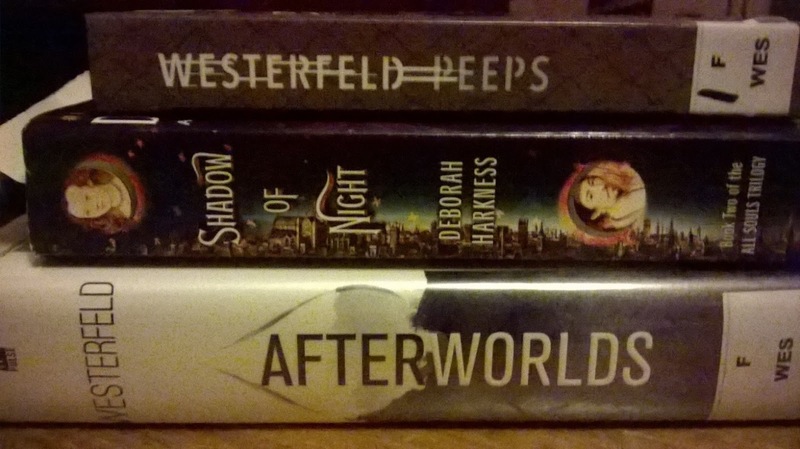 Ok, I love Scott Westerfeld's books, so when I was in the library at work and saw both of these sitting on the shelf, I couldn't resist. One of the perks of being a teacher is checking out books from the school library without a due date, so I can take my time with these two books... although I don't think I will. "A year ago, Cal Thompson was a college freshman more interested in meeting girls and partying than in attending biology class. Now, after a fateful encounter with a mysterious woman named Morgan, biology has become, literally, Cal's life. Bursting with the sharp intelligence and sly humor that are fast becoming his trademark, Scott Westerfeld's novel is an utterly original take on an archetype of horror." "Darcy Patel has put college on hold to publish her teen novel, Afterworlds. With a contract in hand, she arrives in New York City with no apartment, no friends, and all the wrong clothes. But lucky for Darcy, she’s taken under the wings of other seasoned and fledgling writers who help her navigate the city and the world of writing and publishing. Over the course of a year, Darcy finishes her book, faces critique, and falls in love. Woven into Darcy’s personal story is her novel, Afterworlds, a suspenseful thriller about a teen who slips into the “Afterworld” to survive a terrorist attack. The Afterworld is a place between the living and the dead, and where many unsolved—and terrifying—stories need to be reconciled. Like Darcy, Lizzie too falls in love…until a new threat resurfaces, and her special gifts may not be enough to protect those she cares about most." This book was gifted to me in Christmas of 2014, I think, and it will help me with my resolution to finish some of the series I have started, so this is definitely on my reading list for this month. "J. K. Rowling, Stephenie Meyer, Anne Rice—only a few writers capture the imagination the way that Deborah Harkness has with her New York Times–bestselling All Souls trilogy. A Discovery of Witchesintroduces reluctant witch Diana Bishop, vampire geneticist Matthew Clairmont, and the battle for a lost, enchanted manuscript known as Ashmole 782. Picking up from A Discovery of Witches’ cliffhanger ending, Shadow of Night takes Diana and Matthew on a trip through time to Elizabethan London, where they are plunged into a world of spies, magic, and a coterie of Matthew’s old friends, the School of Night. As the search for Ashmole 782 deepens and Diana seeks out a witch to tutor her in magic, the net of Matthew’s past tightens around them, and they embark on a very different—and vastly more dangerous—journey." Have you read any of these books? Or these authors? What did you think? What cool books have you found lately?